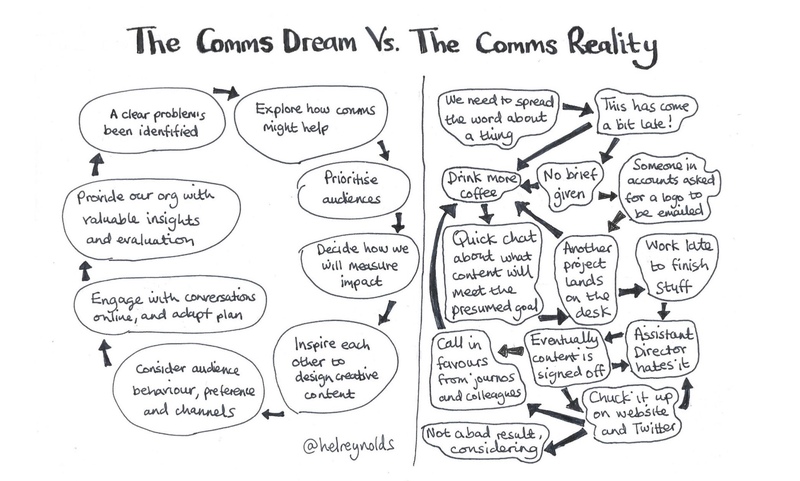 I have written The Comms Manifesto, partly because I want something I can show people when they have the wrong end of the stick about what I do. In my opinion, modern and professional communications has nothing to do with spin, lies and propaganda. This is my idea of what we do. Occasionally, one of my scrawls seems to strike a chord, and I’ve had lots of nice feedback on this one. Quite a few people said they were printing and sharing it, so I thought I’d share a downloadable, good quality PDF here. If you like it, you can download and print the comms manifesto here. You can also buy a mug, a card or a poster with it on – it would make a nice gift for a pal who working in communications. You can see more of my doodles over on Twitter and commscartoons.com. We send messages but we’re not a postbox. We help people take action. We shape and direct our organisations. We promote but we don’t just react to others. We dig and decipher the data and the stories. We protect but we don’t lie. We help colleagues know their purpose and remind them of their duties and hearts. We are experts but we are not dictators. We are on a quest to improve. We’re always learning from science and from art. We promote but we don’t just broadcast information. We interpret. We build relationships. We listen to and understand communities. We deliver but we are not a postbox. We use our powers for good. Previous Is your fear stopping your social media comms from saying anything?